Talk to Betech about your transmission needs. 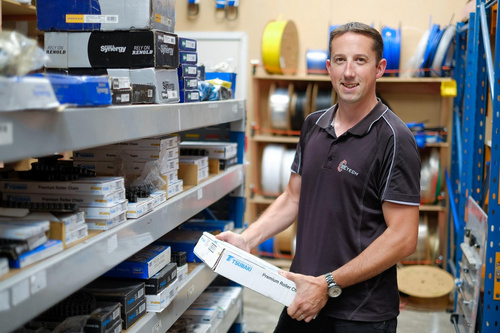 Betech are Dunedin’s locally owned supplier of power transmission belts and components. Whether your firm needs V-belts, timing belts, or drive belts, Betech have got the right component for you. Optibelt is a family-owned business with over 2,500 employees around the world, established in 1872. From robust kraftbands for agricultural machinery to high-performance V-belts used in road construction and precise timing belts for the textile industry – Optibelt products are at home in many different industries and endure extreme conditions. SEW-Eurodrive has been an industry leader in motor/gearbox units since it was established in 1931. SEW-Eurodrive supplies drive systems to over 30 countries around the world. Tsubaki is a leading brand in power transmission and motion control products. They manufacture a wide range of timing, locking, and drive chains and belts. Betech’s sales team know all about belts, pulleys, gears, drives, chains and all the other things that make things go round and round. Give Betech a call and tap into their expertise today.